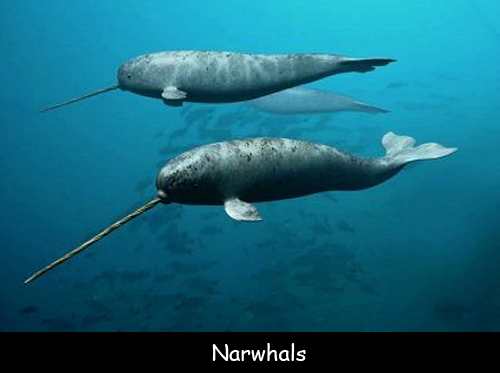 Narwhals seem like mythical creatures, but they’re real. They’re a species of whale that lives in the Arctic waters of Canada, Russia, Greenland, and Norway. Their tusk is not really a tusk at all, but an extra-long tooth. Male narwhals are most likely to grow a tusk-like tooth, which emerges from the mouth. This tooth can grow up to 10 feet long. Occasionally, a narwhal will grow two! Unlike other whales, narwhals do not migrate. They live their entire lives in the northern seas. During the winter, they often spend up to 5 months under the ice, coming up to get air through cracks in the ice. They can dive up to 1 ½ miles deep into the ocean. Narwhals eat squid, shrimp, and fish. Narwhals change in color as they get older. Baby narwhals are blue-gray. As the whales get older, they change from dark gray to mottled gray. Old narwhals are often white. Because narwhals live in the Arctic Ocean and spend so much time under the ice, they’re hard to study. Scientists still have much to learn. Question: What is the tusk for? Answer: The beautiful, spiral tusk is made of ivory. Scientists believe males might use the tusk to impress females or to ward off other male narwhals in pursuit of a female. Visit National Geographic to watch a video about narwhals.